In the mid- to late 19th Century, the city of Bath on the southwest coast of Maine was one of the world’s most productive shipbuilding communities. And no family was more closely tied to Bath’s maritime history than the Sewalls, who built and managed a fleet of over 100 merchant vessels. These ships, mostly square-riggers, were engaged in worldwide trade until the Age of Sail came to an end. 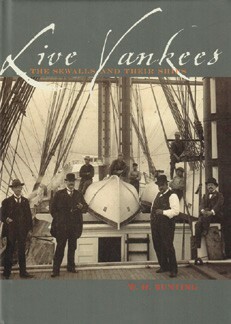 Published in partnership with the Maine Maritime Museum, Live Yankees is a comprehensively researched and marvelously written account of a family dynasty that fueled the rise of the American sailing merchant fleet. All captains of Sewall ships were required to make regular reports to the company office, and author W. H. Bunting artfully weaves bits of this correspondence – accounts of storms, shipwrecks, plagues, “sailor troubles,” and encounters with cannibals – into his captivating narrative. After missing an opportunity to invest in steamships because they failed to recognize the advantages of faster voyages and reduced crew costs that steam power offered – or perhaps because of sheer Yankee stubbornness, the Sewalls steadfastly resisted the inevitable demise of schooners and square-riggers. Generously illustrated with photographs taken primarily from the collections of the Maine Maritime Museum and Andrew Nesdall, Live Yankees provides a fascinating look at a New England family’s fierce determination as they faced the changing winds of technology. A resident of Whitefield, ME, W. H. Bunting is the author of Portrait of a Port: Boston 1852–1914; Steamers, Schooners, Cutters, and Sloops; A Day’s Work: A Sampler of Historic Maine Photographs, 1860–1920; The Camera’s Coast: Historic Images of Ship and Shore in New England; and Sea Struck. To order this a copy of this superb book and many others, visit tilburyhouse.com.